Welcome to the resource center for the JTAG HS1! 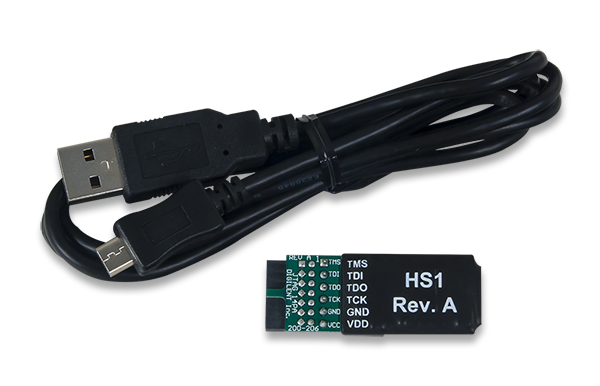 Please note that stock is limited for the JTAG-HS1 and will be retired once the stock is depleted. The JTAG HS1 programming cable is a high-speed programming solution for Xilinx® FPGAs. It is compatible with all Xilinx tools, including iMPACT™, Chipscope™, and EDK. The HS1 attaches to target boards using Digilent's 6-pin, 100-mil spaced programming header, or Xilinx's 2×7, 2mm connector (using the included adapter). Schematic – Schematic currently unavailable, please see the reference manual for product detail. Technical description of the JTAG HS1 and all of its features. The Wiki may contain more up-to-date information than the PDF. Sell Sheet – Sell Sheet is currently unavailable, please see the reference manual for product detail.